Description: Snow White is known to be the „Fairest of Them All”, but now she feels that it`s time to get a new haircut, will you help her? Be the princess`s hairdresser and create an enchanting coiffure in a professional studio equipped with all the needed tools. Trim, curl and dye her black hair in a variety of beautiful colors. 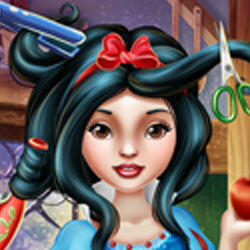 Finish the hairdo with cute accessories and pick a glamorous outfit to go with her new hairstyle!